The periodic maintenance inspections of your fire extinguishers are not just an obvious practical requirement, they are also vital in order to comply with all your legal and contractual obligations. UK Safety provides a comprehensive maintenance and repairs service, ensuring all your extinguishers are in perfect working order and will function as intended in the event that they are needed. We service all makes of fire extinguisher to BS5306 UK Safety engineers are BAFE qualified Technician’s to inspect and maintain portable fire extinguishers and fire blankets. Fire extinguishers that are not maintained annually to the standard are no longer considered compliant. So for a complete service and maintenance, contact the dedicated team at UK Safety today. We’re committed to delivering a professional service at an affordable price, so give us a call and find out how we can be of benefit to you and your business. Competitive prices and an unrivalled quality of service ensure that we are second to none when it comes to ensuring your safety. Our Service Department will remind you when your annual service is due and make the necessary arrangements for an engineer to visit. 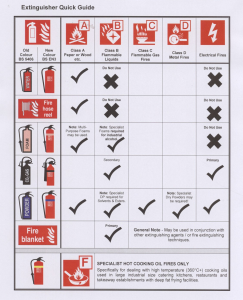 Furthermore we provide a fire extinguisher log which means all the information of your servicing equipment including manufacturer, year of manufacture, next test discharge date and all information relating to each extinguisher and where it is located. Please also bear in mind this provides an ideal opportunity for the training of personnel in the correct use of the equipment and will save you some money. We guarantee to beat any like for like quotation, either from supply of new equipment, or servicing. Please contact our customer services team for a free quotation. Are good for tackling fires involving burning paper, wood and soft furnishings, as the water soaks into the materials (Class A fires). This type of extinguisher does not leave a residue, but does have a comparatively low rating. Due to this factor water extinguishers are larger and heavier to overcome their lacking in fire fighting power. It is important to remember that water is an electrolyte and conducts electricity. Care must therefore be taken with regards to accidental use on mains power. These problems can; however be overcome by installing water extinguishers with additive. This type of extinguisher has a higher fire rating, which therefore reduces the weight of the extinguisher and removes the risk of self-electrocution. Foam fire extinguishers are ideal for multi-risk situations where class A and B risks exist. Class B fires, those involving flammable liquids, such as petrol, diesel, spirits, solvents and lubricants, can be tackled very effectively. The foam fire extinguishers, which are available in both gas cartridge and stored pressure versions, contain an aqueous film forming foam which gives rapid flame knock-down and has a blanketing effect, smothering the flames and sealing vapours to prevent re-ignition. Contain only pressurized CO2 gas and leave no residue. This type of extinguisher is suitable for use on fires involving burning liquids (Class B fires), but is also an excellent solution for quenching fires involving computer equipment and other electrical appliances , as it does not cause damage to the electrical items and does not cause the system to short circuit. It is important to remember that when using CO2 extinguishers there is a possibility that once the gas has floated away the fire may reignite if the source of the fire is not removed (e.g. switching off the power supply). Please be aware that CO2 extinguishers that are not fitted with double-lined swivel horns which may cause your fingers to freeze to the horn during the deployment of the CO2 gas. Also called ABC extinguishers or dry powder extinguishers are suited to fight class A, B and C fires. Powder extinguishers have a good fire fighting capacity, but this agent does not soak into materials and does not have a cooling effect on the fire. This could result in the fire reigniting, if it is not properly extinguished. Care must be taken when using powder extinguishers and they should not be used in small confined spaces where there is a risk of inhalation of the powder. Are suitable for use with fires involving burning oil and deep fat fryers (Class F fires). These extinguishers come with a special application lance which lays a cooling layer of foam on top of the burning oil. Alternatively a fire blanket can be placed over the pan containing the burning oil. The pan should then be left to cool down. NEVER carry the pan outside or lift the fire blanket after a short period of time to inspect the burning oil as introducing oxygen through this action could reignite the fire. NEVER use pressurised water, powder or foam extinguisher on fires involving burning oils as the pressurised jet will cause the burning oil to be carried out of the pan onto surrounding surfaces causing more damage and a larger fire to tackle. By law, employers must provide their staff with adequate means of tackling a fire in the workplace. There is also a legal obligation for a competent person to annually service the fire extinguishers to standard BS 5306 part 3. 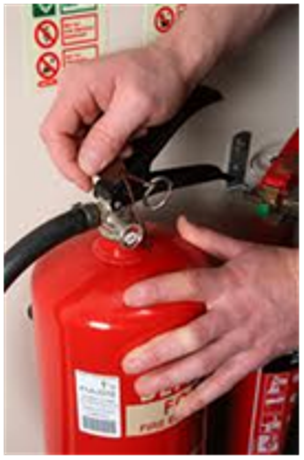 In addition, all fire extinguishers must be maintained in working order and in good repair in between the services. This means that workplaces must also ensure that they carry out their own checks, at least monthly. 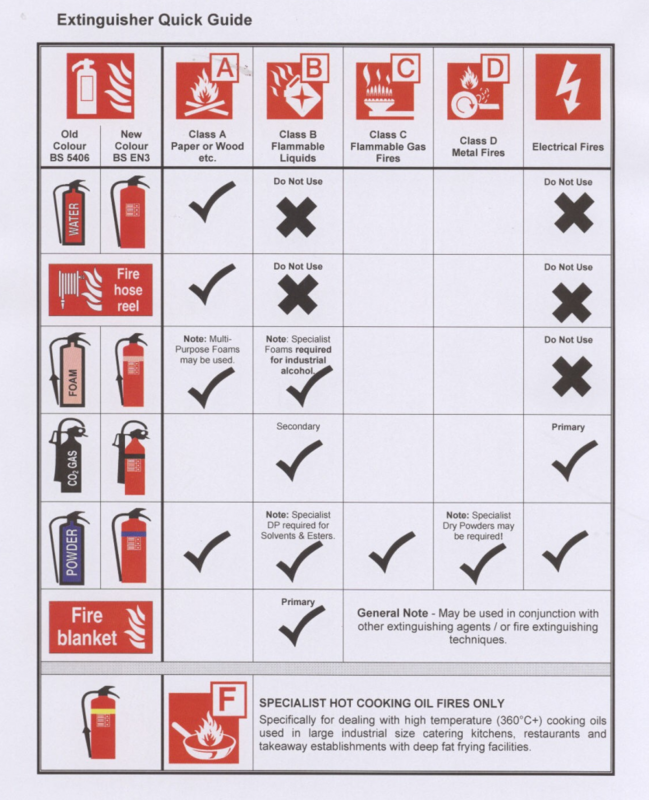 A ‘competent person’ is defined by the British Standard as: ‘a person with the necessary training and experience, with access to the relevant tools, equipment and information, manuals and knowledge of any special procedures recommended by the manufacturer of the portable fire extinguisher, to be capable of carrying out the relevant maintenance procedures of this standard’. We recommend using a registered company which employs qualified technicians, who undergo refresher training every 3 years to keep their industry knowledge up to date. Extended service generally involves carrying out a test discharge on the fire extinguisher, checking internal and external parts, then recharging the fire extinguisher ready for use, if deemed safe by the engineer. BS 5306 – 3, states that water fire extinguishers, foam fire extinguishers, powder fire extinguishers and wet chemical fire extinguishers require extended services every 5 years. Co2 fire extinguishers must have an overhaul & pressure test every 10 years. Most companies carry out a ‘service exchange’ for co2 and powder fire extinguishers due to be discharged. This entails exchanging your old extinguisher for a new or refurbished extinguisher.